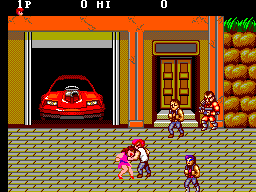 Ah, Double Dragon. They just don't make games like this classic any more. I remember my brother and I playing this one in the Arcade. We truely believed we where Jimmy and Billy Lee. 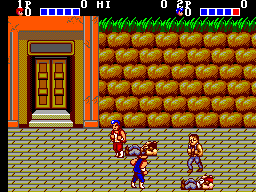 In fact, this is one of the games I played has a child that sparked my interest in the Martial Arts. In 1988, when all my friends had the NES version, I had the Sega Master System Arcade Port Classic. Although, I liked the NES version, I prefer this one over all other eight bit console. Trust me, I have played them all. The hardest is the Atari 2600 version and the one I give respect to is the Game Boy version. But, the one that I remain loyal to is the Sega Master System version. At first, I had trouble hitting the opponents. It was like we were in some bar fight and would hit each other at the same time. The enemies do not beat you senseless like in the Atari 2600 version, but if you try to go toe to toe you will lose alot of health. You do have a large amounts of moves right off the bat just like in the Arcade. The NES version actually has more moves then the SMS version, but that is after you get all your hearts. There's a cool ground and pound move that the SMS doesn't have, but we have a two player mode that makes up for the lost of a couple moves. That is one thing that troubled me, "Double Dragon", only one player for the NES. It doesn't sound right. Well, this was from the company that allowed "Billy" names to spelled "Bimmy" in the third Double Dragon. The 7800 version was decent, but there was no classic technique of grabbing the opponent's hair and smashing their face with your knee and throwing them over your shoulder. The only move I can think that is missing from SMS version is the full nelson technique that you could do to your opponents in a two player mode. All the weapons are there, all the bosses are there and the game is a close port to the Arcade eight bit style. The graphics are good by eight bit standards. Sure, if you are less then 25 years of age, you might think they are terrible. But remember, you grew up with the Sega Mega Drive or Genesis, Super Nintendo and Playstation era. There bits are much higher then the Sega Master System console. Also, this version was only ported over to the Sega Mega Drive/Genesis which was the closes to the arcade. On the SMS, you can tell who is Jimmy, who is Billy, who is Abobo and who is Mary Ann. The back ground is good and the stages follow the arcade pretty closely. The music is OK. I think they are better then the other consoles and I have to give the Nintendo Game Boy a thumbs up on the music. The Game Gear Version has no classic music from the arcade. In fact, if I remember correctly you fight an alien at the end of the game. 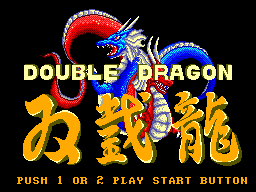 That's not Double Dragon. But enough of the other consoles, you know when you hit someone by the sound. You know when you die. You know when the dynamite exploses. So, I guess they covered the game pretty well. Make sure you have a good controller. I have several where one button works 90% of the time. You are going to be button jamming a bit and when you are throwing down you are going to want every thumb press to count. Believe you are really taking to save your girlfriend. Work on the jumping side kick. If one player gets an opponent in a headlock and the other player as a whip, tear the opponent's behind up. This actually does damage to the opponent : ) Only one jumping part at the bridge and that's a good thing. I remember the NES version. There was several jumping parts and they were a pain. And why can't the Lee brothers swim, that just makes me mad. They are Martial Art Masters flying through the air with wicked Ninja Moves but can't swim. They need to have a shark or an alligator jump out of the water when they fall in to satisfy me. I'm a Master and I can swim. In fact, I can't think of a Master besides these two that can't swim. A great game especially if you have two players. Plus, there are errors in the game that you some time can see. A couple of times, when I rescued Mary Ann, she turned into Linda. It's true but strange. A few times it was Mary Ann's body with Linda's face, Strange. And once, she turned into Bruce Lee and Killed me, just kidding on the last one. This game is a classic. There is a rare blue label version that is a re-release for the NTSC format. They say there is some difference, but I can't seem to find any. If you read this could you email me a tell me. If not enjoy playing a classic game.